A profile is a data structured arrangement which describes a specific set of remaps and sensitivity adjustments. The MaxRemapper plugin supports the creation and maintenance of an unlimited number of profiles. The profiles can shared (or to make backups) through the Export/Import operations. 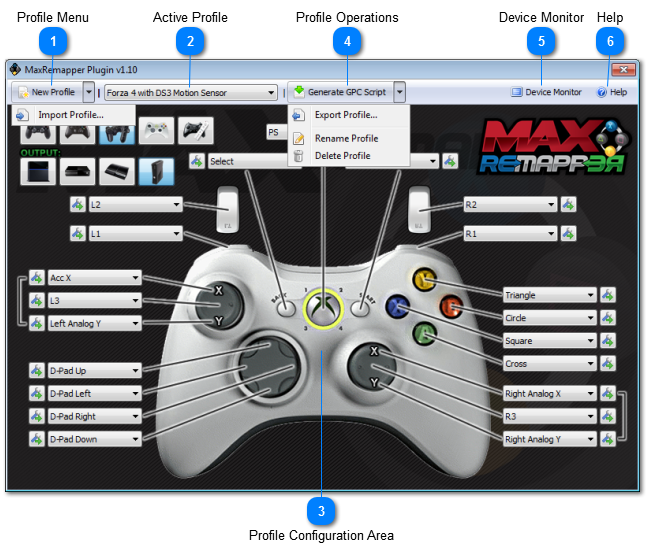 While the MaxRemapper plugin is running all changes made in the profile configuration area take effect instantly. This allows you to check and test all remaps and sensitivity adjustments on-the-fly, before you actually store the profile in a device memory slot. 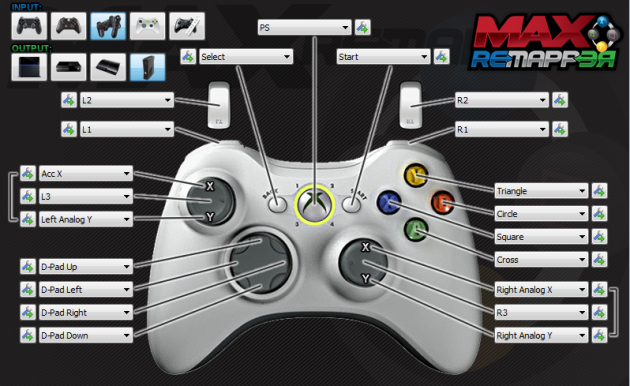 To perform the tests keep a controller connected into your Titan One device, the output (remapping results) can be checked during a game play or in the Device Monitor. • New Profile: Create a brand new profile, with default remmaping settings. A dialog box will popup to enter the profile name. • Import Profile: Import a MaxRemapper profile file, the imported profile may need be renamed if the original name is being used by another profile. The exporting combined with import operation can be used to clone a profile, this may help on the creation of a new profile, since the basic configurations is already done. This combo box lists all profiles you created in the MaxRemapper plugin and it is used to select a profile you want configure. The active profile is also used on generate GPC script, export, rename and delete operations. The profile configuration area is where you will configure your profile. Any configuration should start with selections of the input and output protocols. The input represents the controller you pretend to use with this particular profile settings and the output represents the console. Check out the Profile Configuration topic for more detailed information on this regard. • Generate GPC Script: This operation generates a GPC script based on active profile. The GPC script is exported into Gtune's source code editor, from where it can be edited and saved as a regular GPC script file. • Export Profile: Profile exporting enables you to share profiles with your friends and to have a backup copy. The exporting combined with import operation can be used to clone a profile, this may help on the creation of a new profile, since the basic configurations is already done. • Rename Profile: Shows a dialog box to rename the active profile. • Delete Profile: Delete the current active profile. A warning message will be shown to confirm the deletion. This operation cannot be reversed once it has been done. Interacts with Gtuner software to open the Device Monitor window, a subsequent click on this button will close the Device Monitor. The Device Monitor is a useful tool for check and test your MaxRemapper profiles. To perform the tests keep a controller connected into your Titan One device. On the help button you can access the offline version of MaxRemapper documentation.